NEXT STOP SOWETO VOL. 4: Apartheid Can’t Stop The Funk – Schlockmania! Bad times often make for good art: the pressure of social and political discord can inspire the artist to cathartic extremes, resulting in work that is compelling because it captures the intensity and inspiration of someone whose one escape valve is artistic self-expression. An example of this dichotomy can be heard on Next Stop Soweto Vol. 4, the latest in a series of compilations devoted to South African popular music. It rarely gets political in an explicit way but you can feel the tension being released in the restless yet precise musicality of its selections. Next Stop Soweto Vol. 4 was compiled by Duncan Brooker and draws its selections from a period that spans 1975 to 1985. The domineering hand of Apartheid was felt heavily by South Africa’s music scene during this time but you’d have a hard time guessing it from the inspired, ambitious nature of the music collected here. The tone is set by the leadoff track, “Unga Pfula A Chi Pfalo” by Kabasa: this throbbing slab of afro-rock offsets the funkiness of its percussion and clavinet-driven rhythm with some gruff power chords and occasional twin-guitar solo breaks that give it a shot of hard rock muscle. However, the funk and hard rock elements never step on each other’s feet: instead, they dovetail together beautifully to support an expressive lead vocal, creating a track that is as driving as it is groove-laden. From there, Next Stop Soweto Vol. 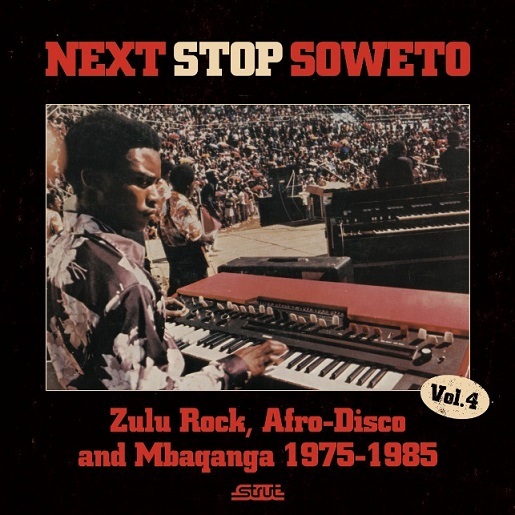 4 maintains this sense of tribal groove as it weaves in a variety of genres: some tracks experiment with a reggae groove (“Ubukhwele” by Margaret Singane) while others tackle disco (“Get Down” by Isaac & The Sakie Special Band) and even bubblegum dance-craze lyrics spiced up with call-and-response chants (“Kokro-Ko” by The Actions). One of the best tracks – “The Things We Do In Soweto” by Almon Memela is straightforward jazz-funk, with a sinuous rhythm and an inspired solo-saxophone lead. However, the key track here might be “1, 2, 3” by Saitana. The chorus has a bubblegum, sing-along appeal but the lyrics offer what appear to be a sly, subtle critique of the ruling class in South Africa: “1-2-3/Your turn is over/4-5-6/Our turn is started.” It’s delivered with a skill enhanced by the sense of urgency you get from artists who have a genuine need to express themselves – and the same could be said for everything on Next Stop Soweto Vol. 4, thus making it a nice tribute to the power of music to carry people through difficult times.